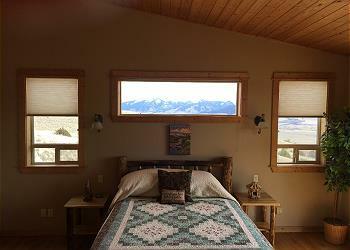 Breathtaking views of the Yellowstone River! BRIEF DESCRIPTION: This 2000-sq. 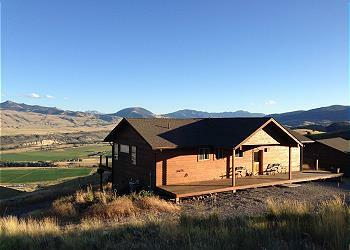 ft. custom home is located about halfway down the Paradise Valley, between Livingston and Yellowstone National Park. 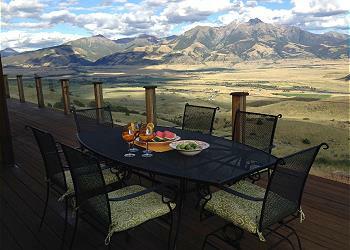 Enjoy stunning views of Emigrant Peak and the Paradise Valley from the living room and dining room, or out on the deck. You will be just minutes from the Yellowstone River! BEDROOMS AND BATHS: This home features three bedrooms and two full bathrooms. 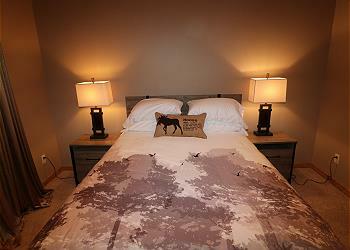 On the main level of the home is the master bedroom with a king size bed and attached bathroom. The large bathroom has a beautiful walk-in shower and double sinks. The other two bedrooms are on the lower level of the home. 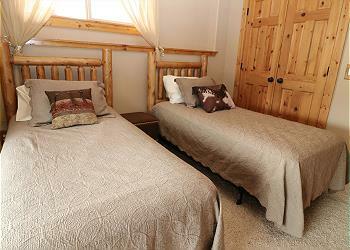 One room with a second queen size bed and the other room with two twins. These two bedrooms share a full bathroom off the hall with a tub and shower combo which also has double sinks. There is also a sofa sleeper in the downstairs living area. The home can accommodate up to eight guests. KITCHEN: This fully equipped kitchen has everything you will need to cook up some great meals for the crew. In addition to all the cookware and serving ware you will need, there is a well-stocked spice cabinet and a gas grill outside for barbecues. Essentials such as a coffee maker and coffee bean grinder are included, as well as conveniences such as a slow cooker, four-slice toaster and full set of chef's knives. DINING AREA: The dining area adjoins the kitchen and living area with a harvest table that will seat up to ten comfortably. 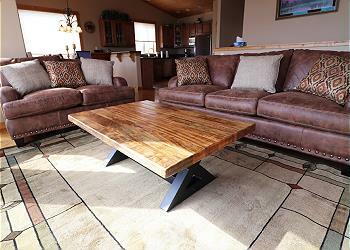 LIVING ROOM: The living room has beautiful leather furniture situated to capture the amazing views. 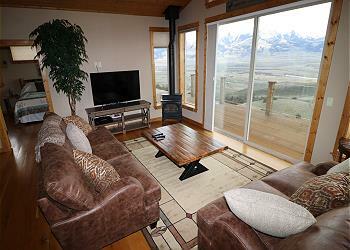 There is a large TV with satellite service and a gas fireplace to warm the room on a chilly day. Sliding glass doors lead out to the wrap-around deck. With the doors open and ceiling fans on, you’ll enjoy a nice flow of air through the home. During the rare weeks of the year that we have really warm weather, the home also has A/C. If your group needs some more room, there is a family room on the lower level. The lower level family room has comfortable seating around the television area abd aksi gas a gas fireplace. You can stream your favorites programs from either TV. There is a sliding door that opens to a cool, shady concrete patio. SETTING, ACREAGE, VIEWS: MountainTop Getaway is on 20 private hillside acres above the Paradise Valley. 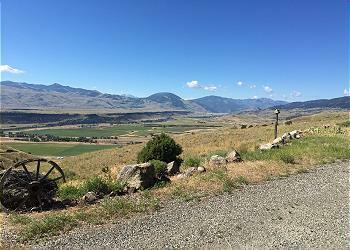 There are a few neighbors within sight, but the home enjoys unobstructed views of nearly the entire valley and the rugged Absaroka Mountains as well. The deck is designed to maximize the views with clear panels instead of wooden railings running the full length of the house. There are two sets of outdoor tables and chairs on the deck that can accommodate up to 10 people. ACTIVITIES NEARBY: Besides hiking and mountain biking on nearby trails, there is fishing on the Yellowstone River just minutes away, horseback riding, rafting, golf, hot springs (Chico and Yellowstone Hot Springs). Yellowstone National Park and everything that the towns of Livingston and Bozeman have to offer. The homeowners also have left a generous library of information on hiking/fishing access points and many local hiking trails.